Vacuum Emulsifier_Anhui Bunkin Chemical Machinery Co.,LTD. 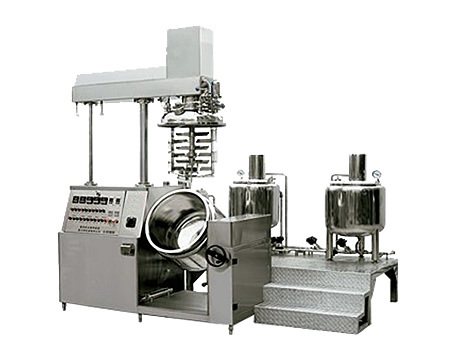 Vacuum Emulsifier is non-standard designed and manufactured according to customer's production processing. Emulsifier pot cover is lifted up and down through hydraulic/electric system. The finished products are discharged by following ways: turn over the pot for discharging, pressurized the pot to discharge the materials from the bottom outlet with the help of the delivery pump. Using the electricity heating bar to heat the thermal medium inside the jacket to heat the material. The heating temperature is settable and can be controlled automatically. It is also ok to input steam for heating and input cooling water to the jacket for cooling the materials down, easy to operate. Homogenizer and blade agitator can be used separately or at the same time. The micronization, emulsifying, mixing, dispersing of materials can be finished in a short time.